Click Here for the Arizona Department of Commerce Page, Arizona Information. Click Here for Shopping in Page ! 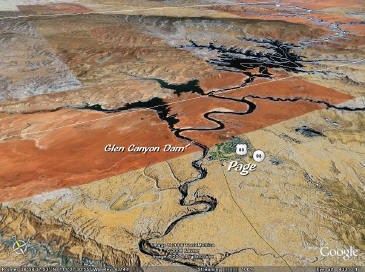 Since the building of Glen Canyon Dam, Page has changed its image several times. It went through two phases as a construction town to the present one of a friendly, inviting and scenic vacation destination for visitors from all over the world. From 1970 to 1975, another construction period took place with the building of the Navajo Generating Station—a coal-fired electric plant just east of page on the Navajo Reservation. Page's population boomed and by 1979, more than 4,000 people lived here. Steadily over the next 20 years, the population would more than double. However, it is with tourism and the influx of visitors that Page has seen incredible growth. Now, 3 million visitors travel annually to Page and its beautiful backyard playground—Lake Powell. Located in the center of canyon country, Page is just a three-hour drive to numerous national parks, monuments and tribal and state parks. Beautiful, red, slick-rock scenery surrounds Page enticing boaters, hikers, bicyclists, photographers, and sightseers. Accommodations are available for visitors from the simple to the luxurious. Dining opportunities abound from elegant to take-out. Native American art and crafts can be purchased as well as a variety of souvenir items in local shops. Page boasts an excellent modern hospital, three medical clinics, three dental clinics, two vision clinics and two pharmacies. Page has an 18-hole championship golf course in addition to the original nine-hole course started by volunteers in Page's early days. Residential home and townhouses are being developed bordering the new course. Page Airport offers scenic and commuter flights and can accommodate larger aircraft. The most photographed slot canyon is just outside Page. Antelope Canyon on the Navajo Reservation is accessible by tour guide year round. Annual events, which draw visitors to this northern Arizona community just minutes from the Utah border, include bass fishing tournaments, mountain bike racing, rodeos, powwows, adventure racing, golf tournaments, craft fairs, music and dance performances, art shows and an air show with hot air balloons, vintage aircraft and monster trucks. In the desert of northern Arizona, page is an oasis of recreational opportunities!